Here’s a look at iPhone usage rates by states. 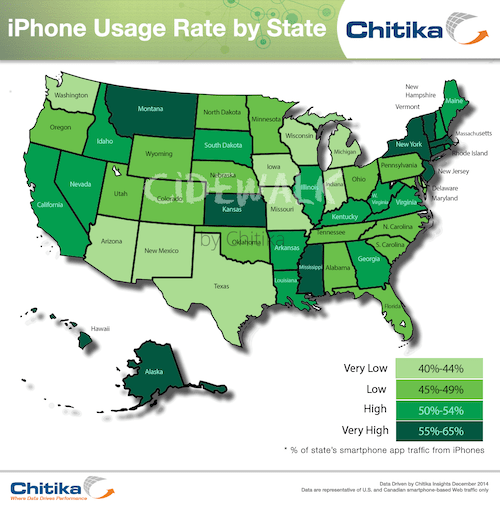 The online advertising network Chitika has released the results of a recent study breaking down iPhone usage rates by state across the United States. To obtain their data, they simply looked at their own ad network. To quantify this study, Chitika Insights analyzed a sample of hundreds of millions of U.S.-based iPhone ad impressions accessed via Chitika’s Cidewalk mobile ad platform. The data were drawn from a date range of December 25 through 31, 2014, thus including traffic from devices given as gifts during the most recent Christmas holiday. Top honors for iPhone usage go to Montana, Kansas, Mississippi, New York, New Jersey, Massachusetts, and Vermont. According to a white paper released along with the study, iPhone usage rates are less correlative to geography or raw population numbers than they are education level and population density. You can read that here. You can view details from the Chitika research below, and read more about the study here. This entry was posted in Apple news and tagged chitika, iphone, study. Bookmark the permalink. New Members Can Grab Amazon Prime for Only $72 This Saturday the 24th.